July 2014 - Interested in local history? Culture? Nature? Join AFHA! Individuals interested in serving in AFHA AmeriCorps for the new term starting in September 2014 can apply by submitting a cover letter and resume to phyllisb@appalachianforest.us. Visit our website for more info. Potential AmeriCorps sub-sponsor sites should let us know immediately if you are interested, and will need to submit an application by end of the month. Balasko, serving as an AmeriCorps member with the North House Museum and with the Ronceverte Development Corporation in Greenbrier County. I have always envisioned myself as a life-long learner. I enjoy acquiring new skill-sets to improve myself both personally and professionally. I found that learning new skills also enhances my view of the world, and my appreciation for the array of professions existing in today’s multifaceted society. When I embarked on my AmeriCorps service year, fresh out of grad school, I did not know what to expect. I knew that I was eager to give back to my community and return home to the state I loved, but I also knew that I was excited to gain hands-on-job skills that would make me a “valid professional" in the working world’s eyes. 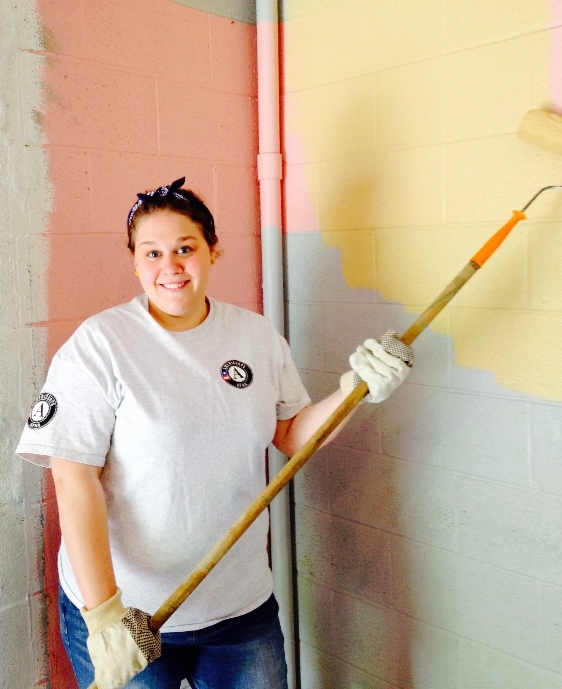 By learning new skills through service, I have gained invaluable experience. During my service year, I have had the chance to meet and work with some amazing members of Greenbrier County. By serving at two sites, I not only had twice the work, but I had twice the chance to form relationships with individuals from two different communities in my county. From PhD professionals to octogenarians; from scientists to teenage volunteers; I had the chance to work and serve with a wide array of people. I shared with them my crafts and skills, and they in return taught me their skills, and several life-lessons. Jennifer and Carling are two ladies that I am very thankful for! They own a small production company in Lewisburg called 84 Agency and they freely offered their editing expertise on an oral history project I created. I have always had a passion for videos and movie-making; however, it was something I never pursued until this year. My oral history project is something that I am very proud of, and very excited about. Thanks to Jennifer and Carling, my project is looking better everyday, and this new skill has opened up a whole new area of expertise for me to call upon in the future. 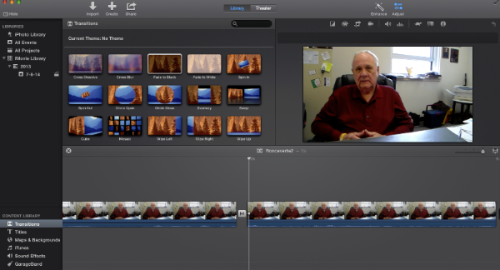 Video-editing software used to compose Balasko's oral history project. Kelsey and Randall helped me by opening my eyes to the natural beauty and habitats of West Virginia. It may not be obvious to you, the reader, but I am not an avid outdoor adventurer. It is not that I do not like the outdoors; they just intimidate me. However, I have attempted to be more adventurous this year, and have had the chance to participate in plantings with Friends of the Lower Greenbrier River, river clean-ups, invasive species training, and water treatment surveillance. I have learned how to identify West Virginian native species, use power tools, and be in the great outdoors. The skills that Kelsey and Randall bring to the table are very different from my own skills, so the meshing of our varied talents has forged a respectful friendship that I hope will continue to grow. I would also like to give thanks to Toni! Without Toni's guidance, I might have considered “throwing in my towel” and walking away on occasion. Toni and I share a love for preservation and we have a mutual respect for caring for the items in the North House Museum. During the AmeriCorps program, Toni was always receptive to ideas, and shared her skills and knowledge of museum collection’s freely. In turn, Toni always sought out my skills as a professional archivist to blend together a plan of action for proper museum preservation. She said that she learned from me, just as much as I learned from her, and I am very glad to refer to her as a good friend at the end of my service term. 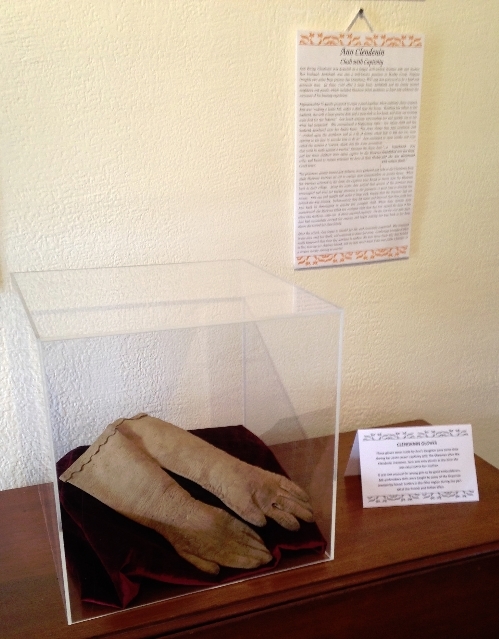 Clendenin Gloves on display at the North House Museum. These relationships and friendships have all been formed through my AmeriCorps service. During my year serving in Greenbrier County I have no doubt that I have given back to my community; but, the individuals in this community have in turn bestowed much more upon me than they will ever know—and for that, I am truly thankful. Halloween party invitation from the early 1900's, at the Beverly Heritage Center. One of the major projects at the Beverly Heritage Center that I took on this year was collections management. Museums of all sorts have collections, which staff can use to put up exhibits, teach classes, and inform visitors. Throughout the year I have been working on a large collection, meticulously cleaning, translating, recording, and accessioning each piece. This requires an abundance of patience, especially during translation! Pieces in the collection range in date from late 1700's to the early 1900's. The collection includes anything from English bank and land information to personalized Halloween party invitations. This work is rewarding, as it allows me to get a glimpse into life in different times. Eventually this collection and others will be completely searchable through the PastPerfect database. Visitors and visiting scholars will be able to work with staff to view and search for specific pieces, documents, or artifacts. This type of project is important within museums because it helps to make collections accessible. It also helps our staff to clean, restore, and properly display our artifacts. A woman's ring, missing the central stone, an artifact at the Beverly Heritage Center. This type of project is also important because it can teach you to care for special family pieces in your own home. Paper pieces tend to degrade faster than any other type of artifact. Cleaning and proper storage and maintenance are key in preserving important family pieces. There are many products for sale that are invaluable to helping clean and preserve paper. Most libraries or museums will be able to assist with these projects and give advice as to which products will be of best use for your artifact. Working with the collections at the Beverly Heritage Center has given me an even greater respect for the preservation of materials of all kinds. Collections management allows for greater visibility of artifacts, and the ability to reach a larger audience, in order to understand the history of the area and how people lived in different times. Cass Scenic Railroad State Park gives visitors the opportunity to experience a historic logging town and the only railroad that remains from a vast network of rails built in 1900 to reach Cheat and Back Allegheny mountains. Today, Shay steam engines, built between 1905 and 1945, pull riders up 2,300 feet past the ghost town of Spruce to the top of Bald Knob, the third highest point in the state. The town of Cass has been restored and guided tours of the town are offered. Company houses, cabins, and cabooses are available for rent. Trains run now through early November. The Beverly Heritage Center tells the story of the Battle of Rich Mountain and the First Campaign of the American Civil War, the pivotal role of the Staunton-Parkersburg Turnpike, and daily life in a small rural county seat through the 19th Century. This month, the heritage center will be partnering with the Beverly Volunteer Fire Department to offer Beverly Week. Events will include everything from Civil War living history, to a Historic Homes tour, BBQ, parade, and fireworks display. Stop by, there will surely be something for everyone! 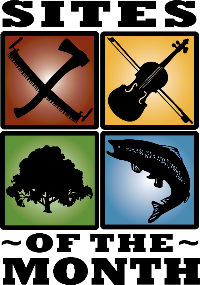 The Augusta Heritage Center, located at Davis & Elkins College in Elkins, is known nationally and internationally for its activities relating to traditional folklife and folk arts of many regions and cultures. Augusta offers intensive week-long workshops that attract several hundred participants annually. Thousands more attend the public concerts, dances, and festivals also offered. These world-renowned workshops and festivals bring together masters and enthusiasts of all ages. This week is Blues and Swing Week, which culminates in a public dance on Friday, the 18th. Watoga State Park is located in the mountains of Pocahontas County just 14 miles south of Marlinton, West Virginia. The park consists of 10,100 acres and recreational activities abound, including hiking, swimming, fishing and boating. There is something for everyone to enjoy at Watoga State Park. The park offers special programming throughout the summer. This Friday, July 18th, check out "Good Bugs, Bad Bugs!" to learn about helpful native species, as well as pests that wreak havoc on our woodlands. Copyright © 2014 Appalachian Forest Heritage Area, All rights reserved.